A Tampa firefighter is back to work after being electrocuted and then brought back to life in December. 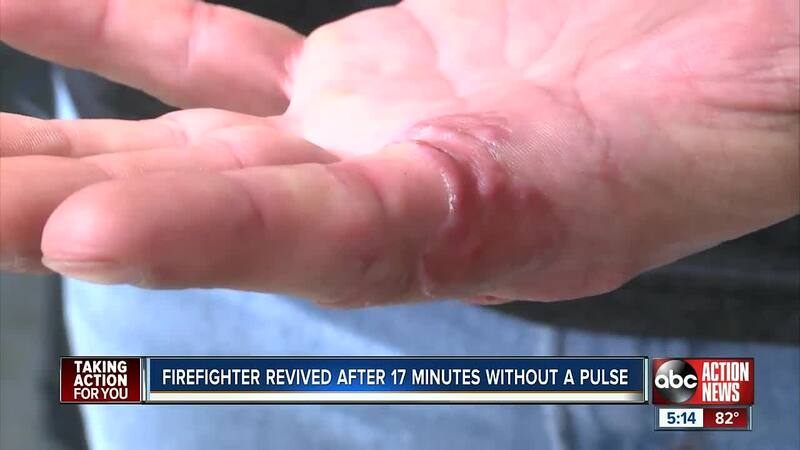 TAMPA, Florida — A Tampa firefighter is back to work after being shocked and then brought back to life in December. Wesley Stevens enjoys wood working as a hobby. He got into a process called fractal burning, which is a technique that electrically burns unique branch like designs into wood. "I was pulseless in the driveway, and the friend that was with me, she began CPR after calling 911,” he said. Hillsborough County Sheriffs Deputy Ernie Foster was on another call down the street and was able to get to his house within a minute. Because of his quick response, he was able to start CPR on Stevens right away. That most likely saved his life. They say the typical response time is around three to four minutes. According to paramedics, Stevens' heart stopped beating for 17 minutes. He was technically dead. "Dead is no pulse, not breathing and he was there. Without intervention, he was not going to survive whatsoever,” said Lt. Ryan Anusbigian, with Hillsborough County Fire Rescue. "It is a very long time and I would say it’s extremely unusual because most cardiac arrests are not witnessed, it was the CPR that really did him good,” said Lt. Anusbigian. "If you imagine holding your breath for four minutes versus holding your breath for 60 seconds, and that was really the difference there." "That was a big reason I was fighting to come back,” said Stevens. "It’s just not worth it, especially with Morgan here now I just don’t need it,” he said.